It’s a rare thing these days to know exactly where your food comes from, rarer still to be able to visit that place and meet the people who grow it. 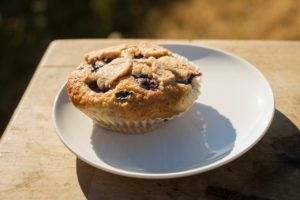 So when I heard that Smokin’ Willy’s makes its blueberry muffins with organic, locally grown berries, it sounded like a great opportunity to tell an uncommon story. As I soon found out, it was far more interesting than a simple farm-to-table tale. 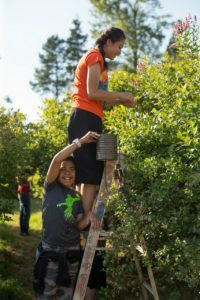 Here’s where it gets interesting: The crew of workers enlisted to whack the weeds and battle the blackberries would be volunteers from Estee’s church, ​Open Door Baptist of Kent​, and all the profits from the season would go toward an upcoming mission trip to Zambia. The volunteers range in age from 5 to 70 with the bulk of them being teenagers on summer break. 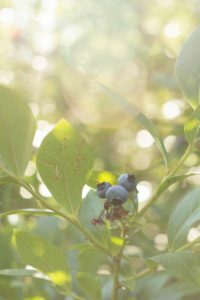 In just the first week, 33 people worked a combined 310 hours reclaiming the bushes from the overgrowth and clearing aisles for the berry loving masses.